‘Doug the Dakin Dog’ traveled throughout Western Mass. on Valley Gives Day to promote the second annual e-philanthropy initiative. On Dec. 11, Flying Object was a small, relatively obscure nonprofit agency based in Hadley that was quietly carrying out its mission to provide opportunities and educational programs to writers, artists, musicians, and publishers, locally and nationally. On Dec. 13 … well, it was still carrying out that mission, but it was far less obscure. And it had an additional $33,230 with which to carry out its work. And that’s because of what happened on Dec. 12, or Valley Gives Day, as that date is now known in this region. 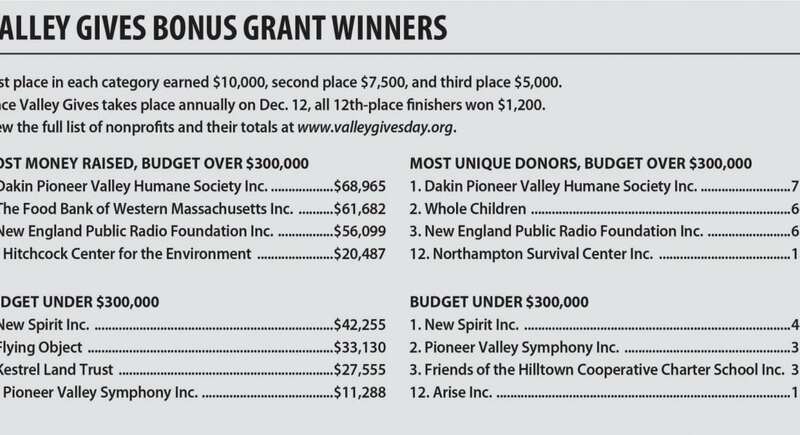 Indeed, those involved with Flying Object, including Executive Director Guy Petit, its only paid employee, “had their act together” on Valley Gives Day, said Kristen Leutz, vice president of Philanthropic Services for the Community Foundation of Western Mass., the managing organization for the program. By that, she meant that the agency was organized, worked hard to get its name and mission out to the public, and took full advantage of the many events and initiatives scheduled that day — from so-called ‘golden tickets’ to ‘power hours’ — as well as the online giving, or e-philanthropy, concept that is so appealing to the many young people involved with Flying Object. And when the 24-hour giving period had ended, the nonprofit, launched just three years ago, had taken second place in the ‘most money raised’ category for organizations with budgets under $300,000, and thus earned another $7,500 in the process. “The day after, the guys at Flying Object were here [at the Community Foundation] for a meeting, and I said, ‘well, everyone knows who you are today,’” said Leutz, adding that there were many nonprofit agencies that similarly had their act together on Valley Gives Day, enabling the program to meet the ambitious goal of raising $2 million ($2,012,089 is the official number), doubling the total from the inaugural year in 2012, and creating a great deal of momentum for 2014. While still basking in the light of their successful event, Valley Gives organizers have essentially moved onto the next edition of the program. The team is already preparing surveys and poring over the data from this year’s efforts, while also watching — and learning from — similar iniatives around the country. For this issue, BusinessWest takes a look back at Dec. 12, but then turns the focus to the future and where this already hugely successful event can go from here. 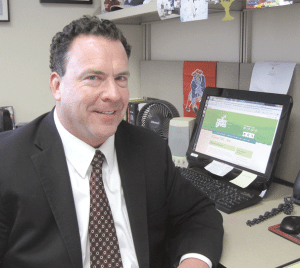 When a volunteer for the inaugural Valley Gives Day approached Mark Teed in downtown Springfield’s Tower Square last year, he gladly gave $100 to his favorite nonprofit. Teed, senior vice president of investments at Raymond James in Springfield, didn’t even know about the program then, but this year he was prepared, if not totally up to speed on some of the recent changes that encouraged online interactivity and presented new opportunities for the 350 participating nonprofits. Splitting $100 among 10 different agencies in Franklin, Hampden, and Hampshire counties this year, Teed’s donations just happened to come during the day’s third power hour, between 4 and 5 p.m., and one was chosen at random to be a ‘golden ticket,’ allowing that nonprofit to receive an extra $1,200. Golden tickets and power hours are fast becoming part of the local lexicon, especially within the nonprofit community, as Valley Gives continues to broaden its influence. Based on the model used by the Minnesota Community Foundation for the Give to the Max Day event, or GiveMN, as it’s called — which has facilitated more than $75 million in donations to 6,600 Minnesota-based nonprofits and schools since 2009 — Valley Gives is providing more solid evidence of the effectiveness of e-philanthropy in boosting donations to nonprofits, said Leutz, adding that the program enables people like Teed to choose from more than 350 participating nonprofits, in an easy-to-use format. 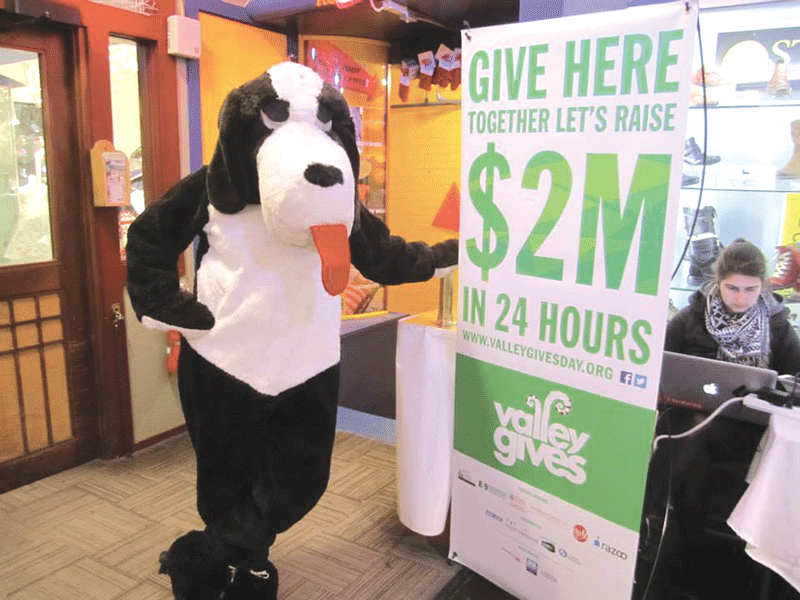 Philanthropy is encouraged by program organizers, as well as individual nonprofits, who filled area residents’ e-mail boxes with reminders that Valley Gives Day was coming and messages about why their agency was worthy of support that day, and in general. And the competition is spiced with special programs and incentives that, as Teed and countless others learned, could make an individual donation become so much more. These incentives helped trigger a number of individual success stories, such as the one authored by Flying Object. Launched in 2010, the agency has produced, hosted, and coordinated more than 250 events and exhibits and dozens of workshops, and published more than 60 books through its Factory Hollow Press, said Pettit, adding that it signed on with Valley Gives to gain visibility and more operating revenue — and wildly exceeded its expectations with both goals. But there were many other big winners that day. 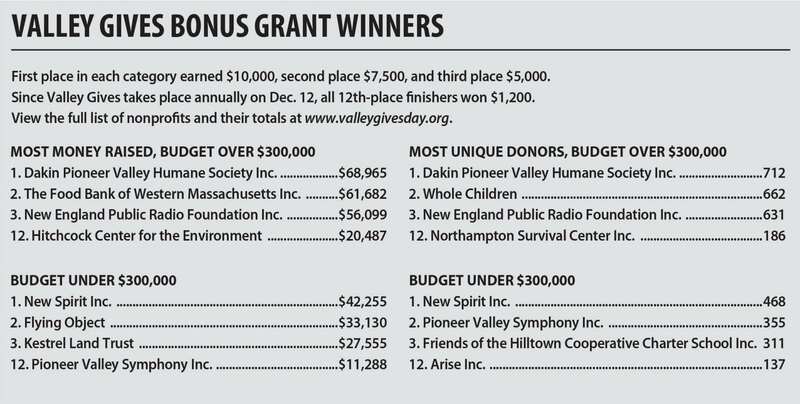 For the second year in a row, Dakin Pioneer Valley Humane Society had the highest total of donations, with $68,965, putting it atop the field among nonprofits with budgets of $300,000 or more. The agency also boasted the highest number of unique donors, with 712. Those accomplishments netted Dakin an additional $20,000 ($10,000 for each competition) from the prize pool. “That was thrilling for us because you know you’re reaching a lot of people, and every gift matters,” said Candy Lash, manager of marketing and communications for Dakin, which operates with a budget of $3 million. She attributes the amount of unique donations to a huge Facebook following of people who enjoy Dakin’s creative and engaging videos online. To help promote participation, Valley Gives organizers had three mobile giving teams roaming Western Mass., from downtown Springfield to Greenfield, with iPads to help passersby make gifts to their favorite nonprofits. Meanwhile, Lash and ‘Doug the Dakin Dog’ traveled around the Valley as well, encouraging people to donate. The outreach proved extremely successful, with some calling it the best way to encourage a new generation to give. Michael Balise says Balise Motor Sales donated graphic and digital-marketing expertise to this year’s Valley Gives effort. Not all sponsors of Valley Gives donate money; in the case of Balise Motor Sales, the effort was more a donation of time and talent through graphic art and digital marketing assistance. President Michael Balise said that, while the company tends to limit its charitable giving to 501(c)(3) organizations involving children, youth sports, and family nonprofits, Valley Gives is a “no-brainer” for his auto group. Colleen Loveless, executive director of Rebuilding Together Springfield, agreed. But reaching, and keeping, these new donors will require continued momentum and quite possibly fresh new contests and challenges each year. Pettit, for example, said he believes that more mobile giving teams roaming the Pioneer Valley that day with their iPads will increase on-the-go electronic giving. Meanwhile, Loveless would like to see if donors could have a visual representation through a meter on donation pages to show how the nonprofits challenge themselves to meet increased Valley Gives fund-raising goals from year to year. To that end, the Community Foundation is preparing surveys for nonprofits and donors this month, said Leutz, adding that the results should prove invaluable to organizers as they go about the challenging task of continually raising the bar when it comes to the annual goal, and then meeting or exceeding it. And what will the goal be for 2014? 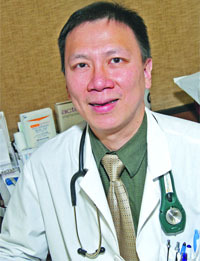 The results from the first two Valley Gives Days clearly show both the philanthropic nature of the Valley’s residents and businesses, and the power of the Internet as a way to facilitate giving, thus offering area nonprofits and schools more resources with which to carry out their respective missions. Thanks to Valley Gives, his organization — and many others — have considerably more dollars to squeeze.